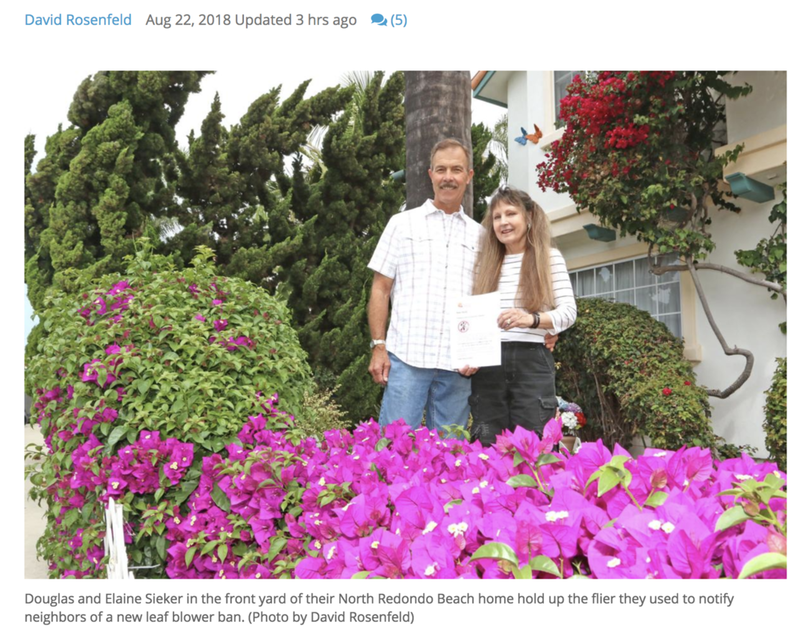 Redondo Beach Bans All Leaf Blowers — Quiet Clean D.C.
"Leaf blower bans have been spreading across the country." From The Beach Reporter. Soon after the ban on motorized leaf blowers took effect on Aug. 11, [a local family] the Siekers made up fliers notifying their neighbors about the prohibition and went around the neighborhood passing them out and speaking with people. Redondo Beach is actually late to the leaf blower ban game. The city of Los Angeles instituted its ban in the 1990s and similar bans exist in neighboring beach cities including Hermosa Beach and Manhattan Beach. For the past 20 years, leaf blower bans have been spreading across the country. The Siekers were told by an arborist that leaf blowers could have been destroying their 20-year-old geranium plants. The arborist told them leaf blowers can push aphids and other insects from grass and leaf clippings into plants, Siekar said.